Augmented reality is getting a bit dull, let's be honest. When Google Glass ceased to be, the interest in the technology began to dry up – at least on a consumer level. The talk now revolves around the use of AR in an enterprise space – it makes much more sense, but it's not going to create headlines that will re-energise widespread interest in the technology. Come on, how much does advanced warehouse management really fire your passion? Looking at Sony's stand at the Wearable Technology Show, you'd think there wasn't much here to reignite that fire. It's showing off the same SmartEyeGlass hardware it launched over a year ago, with no alterations, seemingly confirming that the big brands are pulling out of the space. Trying on the glasses is still a cool experience, still something that makes you feel like you're peering into the future. The headset is lighter than some I've experienced, and closer to real glasses (thanks to the battery and processing being dealt with by a separate controller that dangles off). However, as you can see above, the headset is still a long way from something you'd happily walk down the street wearing (unless you wanted to pretend you were heading to some futuristic techno-rave where an apocalypse has forced everyone to give up on fashion completely), and with consumer interest in the space all but over, you'd think AR was heading into the 3D bin. But there are signs the technology isn't dead – just repointed. A company called Opera Touch has been working with the SmartEyeGlass, and has created an app that enables opera audiences to use augmented reality to see subtitles of the show in a large number of languages. My first feeling was that this was technology for the sake of it – after all, there are subtitles above the performance to offer this very functionality. (I'm not going to pretend I already knew this, or pretty much anything about opera – I found out while trying the glasses). However, the issue is that having to scan up and down to see what's being said is jarring, and makes it difficult for the audience see what's going on and follow the words at the same time. AR can bring the experience of subtitles in films to a real world performance. On top of that, the glasses can also feed information on the artists, and let the audience see the score unfold in front of them, offering something that the subtitles on a screen can't. A spokesperson for Opera Touch told me the new company has already sold the system into an opera house in San Sebastien, Spain, and is in talks to do the same with larger venues in the UK, US and Spain in the future. While it does depend on the business model of each opera house, the spokesperson told me the use of the glasses may either be bundled into the price of the ticket at purchase, or hired at the venue. While Sony says the system was reviewed favourably when trialled in February, it's still an odd experience trying on the glasses. The monochrome green writing is initially quite off-putting, making you think there's something smeared on the glasses that needs to be wiped off. However, once you focus on the words they're a lot sharper than I expected. It's easy to read them and still see the action behind (admittedly, shown at the show on a video monitor) thanks to the glasses offering over 85% transparency. If I truly wanted to watch the action as normal and have the words just an eye flick away, I found I had to lift my head to a slightly unnatural angle – but compared to having to repeatedly move my focus away from the performers, this was a much better option. What I didn't understand was Opera Touch building in a 'Bravo' button in the app. Below being able to select a number of different languages, users could also press a button to auto-tweet what opera they were watching and where. It's both a weird brag, and a series of hashtags that doesn't seem to serve any purpose – unless they were linked to special underwear the performers were wearing that vibrate every time someone liked what they were hearing. Speaking to Joakim Elvander, developer advocate for Sony Mobile, it seems that perhaps AR technology isn't dying as an overall concept either, with niche uses banding together to keep head-mounted displays viable. He called the state of AR 'divergent' (where the smartphone is the ultimate convergent device), stating that it was still too early to keep iterating on the design while only a small number of developers are coding to use the SmartEyeGlass. 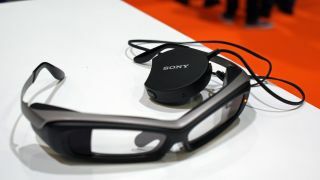 However, units are still being sold into the enterprise space in bulk, with Elvander stating that Sony is selling SmartEyeGlass products to companies creating motorcycle helmets or for use in fire fighting scenarios – not just the glasses themselves, but the display technology and controllers being fitted into visors too. The actual use of the AR headset depends on the app that's been coded for it, using any phone running Android 4.4 or above. It makes sense, then, that the rumored Google Glass 2 is being pointed at the enterprise market. While the number of companies that are actually building apps and using Sony's technology is a long way from myriad – some of the most impressive demos on the stand were still the concepts seen from months ago – there's still some momentum around AR that's worth keeping an eye on. And if we can do that without having to look at a second screen, then all the better.